Episode 1: Amelia Bennett just wanted a nice cheap vacation to New York City; she didn’t plan on finding the perfect engagement ring and the perfect man. 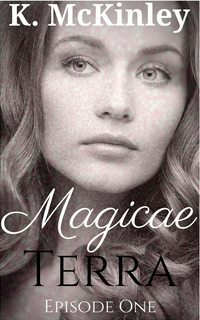 To have those two events eclipsed by the shocking discovery that magic is real turns her world upside down. Episode 2: Amelia is dealing with the fact that magic is real fairly well, but now she has to make her way through a magical barrier that wants to kill her. All because she happened to get on the bad side of an evil warlock. Episode 3: Amelia survived the Barrier, barely, now she just has to figure out what to do next. Her first job leaves a lot be desired, but she can’t complain since none of her modern-day skills transfer to the world she finds herself in. If she could only make some friends her new life might not be so bad. Episode 4: Amelia was just your average twenty something woman until her entire life was turned upside down. She’s survived an encounter with an evil warlock, traveled through a sadistic, magical barrier, and now she’s just finished her first nine months in a new world. What else could possibly happen? After receiving the news of a lifetime Amelia leaves the only home she has and starts a new stage in her adventure. Things just might be starting to look up. Hopefully her lucky streak holds. Episode 5: Actions have consequences in Episode Five Cause and Effect, and Amelia has to pay for mistakes that even she didn’t make. Life keeps throwing her curve balls and Amelia’s afraid, sooner or later, she won’t be able to keep playing. Episode 6: An old enemy shows up and Amelia has to fight to for more than her life this time. As an uncontrollable rage consumes her, she races to save the only thing that matters.